Below you can scroll your mouse over the image zoom, or search ALADIN LITE which uses "Aladin sky atlas" developed at CDS, Strasbourg Observatory, France. The default location I've set is at the nebula M78 using the SDSS9 survey. You can select different surveys using the page-looking tab on the top left. For a fuller sky coverage survey in more normal light colors try the DSS Color survey. You can also enter a right ascension and declination of any part of the sky or enter the designation (like "M51" or "Castor" using the magnifier glass icon. Solar system objects like planets, the Sun, comets and asteroid names do not work in this tool. Below is a more detailed sky map as it would appear over Central Florida at 9 p.m. on April 10th (from the free ​​Stellarium program​). Other Florida location sky views will be very similar to this view at ~9 p.m. during early April. 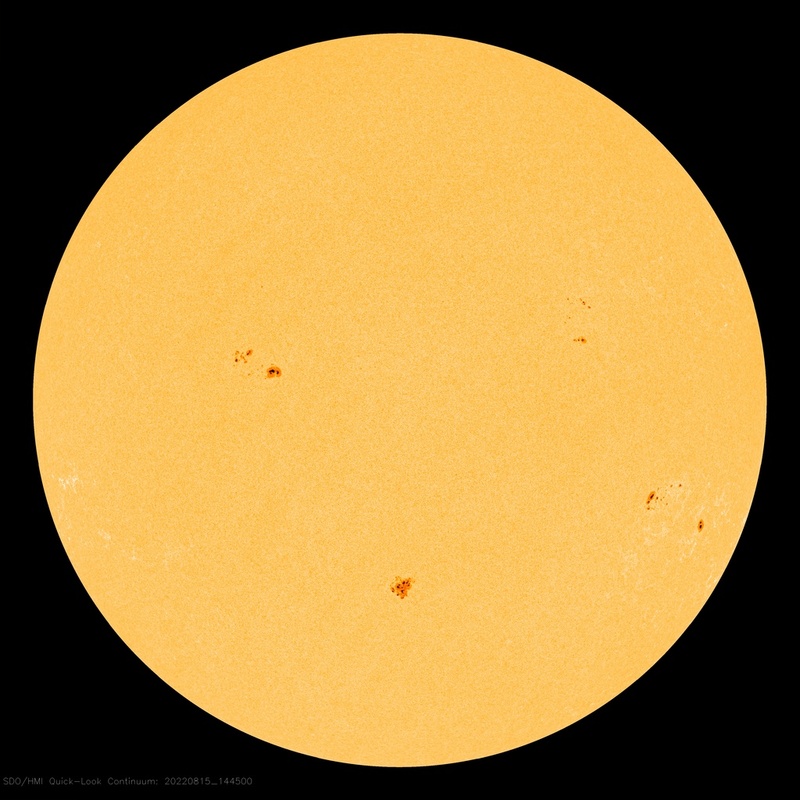 Current image via NASA's Solar Dynamics Observatory satellite. It shows sunspots when they are visible. 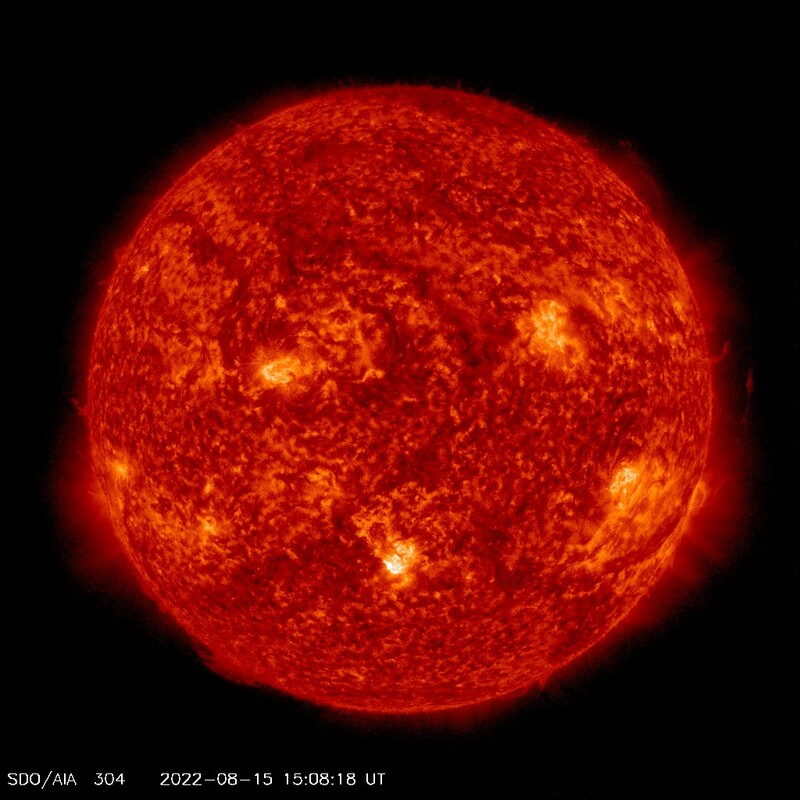 Below is the latest Sun image from today via the SDO AIA304 filter (which is the 304 Angstrom or 30.4 nanometer emission wavelength of the helium ion.) Images courtesy of NASA/SDO and the AIA, EVE, and HMI science teams.